The perfect way to experience the sights, wildlife and history of the famous loch. A relaxing trip for the whole family. All you have to do is enjoy it - it’s impossible not to. Departing from Fort Augustus at the southern end of Loch Ness, you’ll soon be treated to the breath-taking vista of Loch Ness in all its natural wonder. Our custom built vessels are the perfect way to experience the sights, wildlife and history of the famous loch. 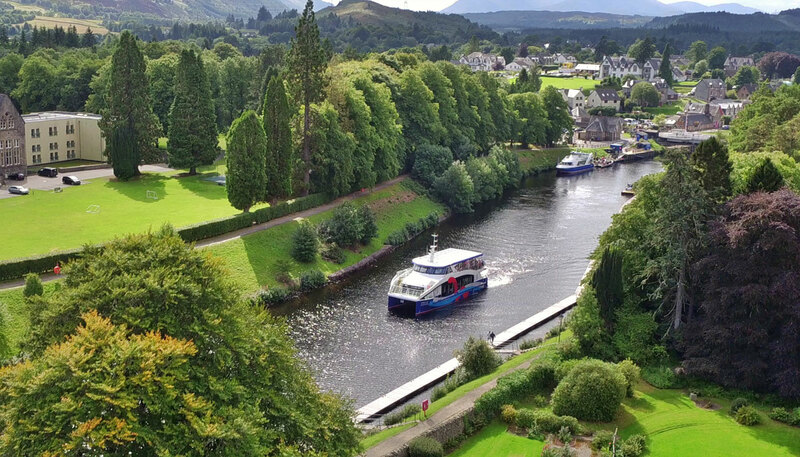 Sit back with a drink, as we cruise past Cherry Island, the loch’s only island and spoil you with a loch-side view of the striking Fort Augustus Abbey. For those curious about what’s beneath the deep waters of Loch Ness, our top of the range Sonar equipment beams live images. The best tour guides on the loch will explain it all, in detail - the only way they know how. As long as the kids pay attention! Our snacks and cakes are perfect with a hot drink. Do they run all year? We could give you details for best way to find us but it would be long and you would probably get bored by the end of it and forget. So, the easiest way to find us is with Google Maps. The main car park is located in the centre of Fort Augustus village (PH32 4DD), just next to the petrol station. Our daily cruises last approximately 50 minutes and our evening cruise is around 1 hour long. Sure they do. Have a look at our cruise timetables for seasonal variations. Please note that no refund can be offered for trips cancelled within 24 hours of departure time. Any valid refunds will be processed less a 20% administration fee. Yes, we welcome dogs on all of our boats. Please check with us beforehand to make sure it’s not too busy on board but we’ll always do our best to accommodate. Yes but you can’t see Nessie from them. Yes. Please contact us in advance to your arrival.